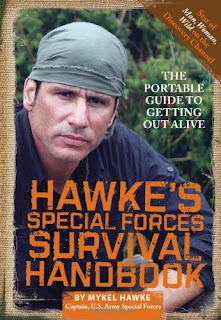 Earlier this year I wrote about how I thought survival expert, Mykel Hawke's, rule of thumb for edible berries is bogus. At face value, it is not a fool proof way for finding edible berries in the wild and if you only go by that rule I'm not wrong about how you shouldn't use that as your only guide for finding edible berries. The problem is that if you read more on Hawke's survival methodology he doesn't exactly tell people they should eat anything unless they are sure of what they are eating. I've owned Hawke's Special Forces Handbook for quite a while now, and up until recently I've only thumbed through it and picked out bits of information. I finally decided to read through it cover to cover and I found that Hawke actually recommends staying away from edible plants unless you know what you are eating and there is a lot of it available. He actually recommends only eating meat in a survival situation as it gives more "bang for your buck"! If I haven't made it plain and clear before, let me do so now: Eating unknown plants can be deadly! Look at it this way, 90% of the plants on the planet are not edible for humans, but, conversely, 90% of the animal life is! Animals and insects can meet about 90% of all your nutrition needs in a survival situation, and it's an easier and safer bet to catch and kill animals than trying to subsist off of plants alone. Ounce for ounce, you will always get the most calories from meat over any other food source out there. Hawke does explain the Army's method for finding edible plants in an environment and contrasts that with his experience and ideas. He also talks about his rules for berries, but gets more in depth saying that not all of the purple and blue ones are edible. So instead of "if they are purple or blue they are good for you, if they are yellow and white they probably aren't right" he says 90% of purple and blue are good for you, and 90% of yellow and white just aren't right. In general if you read Hawke's writing about plants you can see why he recommends just eating meat because there are so many plants that can kill you. Every section on every set of plants comes with some sort of warning. Long story short, I owe Captain Hawke an apology. I think the smart thing to do is to not take what survivalists say on TV shows at face value and either do more research yourself, get more training on the subject, or buy their book to see exactly what they are talking about. Hot, dry summer fuels grizzly attacks in B.C.